Over millions of years, rain, rivers and streams have washed over rocks containing the compound sodium chloride (NaCl) and carried into the sea. Some of the salt in the oceans of the world come from undersea volcanoes and hypothermal vents. When water evaporates from the surface of the ocean, the salt is left behind. Different bodies of water have different amounts of salt mixed in, or different salinities. Salinity is expressed by the amount of salt found in 1,000 grams of water. 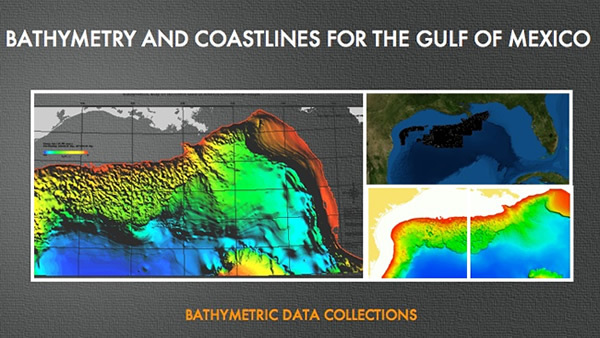 The average ocean salinity is 35 ppt. The number varies between 32 and 37 ppt. Rainfall, evaporation, river runoff and ice formation cause variations. Salinity is an ecological factor of considerable importance, influencing the types of organisms that live in a body of water. As well, salinity influences the kinds of plants that will grow either in a water body or on a land fed by water. Salt is expensive to remove from water and salt content is an important factor in water use. sinking and rises of water masses. Changes in the salinity of the oceans are thought to contribute to global changes in Carbon Dioxide as more saline water are less soluble in Carbon Dioxide. There are two methods to determining the salt content of water: Total Dissolved Salts (or solids) and Electrical Conductivity. TDS is measured by evaporating a known volume of water to dryness, then weighing the solid residue remaining. EC is measured by passing an electric current between two electrodes in the water sample and measuring how readily current flows between the two electrodes. The more dissolved salt in the water, the stronger the current flow and the EC measurement of EC can be used to give an estimate of TD's. Generally, these kind of investigations are carried out by marine biologists. Another technique, generally used for small scale marine aquariums, is a salt meter. Get a rope and make equally spaced marks on it. Lower it into the ocean and count how many marks go on before you hit the ocean floor. SONAR (Sound Navigation And Ranging) is when you make a sound in the ocean and time how long it takes for the echo to reach you. Light absorption in the sea reduces the amount of visible light rapidly with depth. 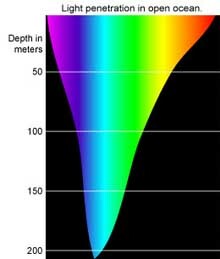 The colors that your see beneath the sea depend on the wavelength of light available to illuminate the object. Only 73% of the surface light reaches a depth of 1cm. Only 44.5% go the surface light reaches the depth of 1 meter. 22.2% of the surface light reaches a depth of 10 meters 0.0062% of the surface light reaches a depth of 200 meters therefore at this depth in the sea it is pitch black as so little light can penetrate 200 meters deep, the solar radiation has been observed. Also, because water is a substance which is 800m times denser than air, as soon as light enters the water, it interacts with the water molecules and suspended particles to cause loss of light, color changes, diffusion, loss of contrast and other effects. To measure the light intensity in water we can use a light meter, a device used to measure the amount of light in a place. You don't need qualifications to use one, its easy for anyone to use and cost around £60-£150.